The first case of myeloma was documented in 1844. With the year 2016 coming to an end in a few days, myeloma is now 172 year old strong. But is it going to remain as strong in the next coming years? With ambitious planning like the Cancer Moonshot 2020, highly effective novel drugs and cutting edge technologies like development of engineered CAR T cells and specific monoclonal antibodies in the anti-myeloma armamentarium, it’s highly unlikely. So, what did we learn about Myeloma on CureTalks in 2016? Here is the list of CureTalks that highlighted the most recent developments towards myeloma treatment in 2016. Four new drugs were approved by the FDA in 2015, increasing treatment options and allowing new combination regimens. Multiple Myeloma Research Foundation (MMRF) enrolled 1000 patients in the CoMMpass study which aims at mapping each of these patients’ genomic profiles to clinical outcomes to develop a more complete understanding of patients’ responses to treatments. We talked to Anne Quinn Young of the MMRF to understand the significance of progress in myeloma research in 2015 for the myeloma patient community. Ann Quinn: 2015 was really a historic year for myeloma. We had four new drugs approved, including three during a whirlwind three weeks before the end of the year; and what’s really even more exciting about these four drugs is that they represent two brand new processes. 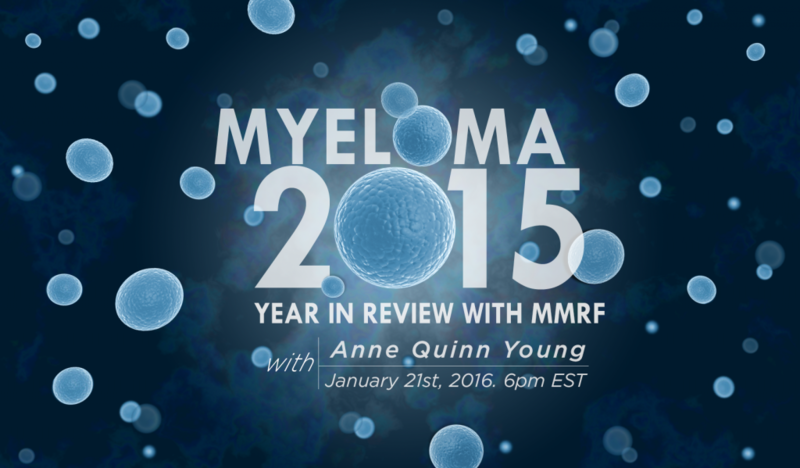 Listen to the talk on Myeloma Review 2015 with MMRF HERE! Daratumumab is the first monoclonal antibody approved for treating myeloma and provides another treatment option for patients who have become resistant to other therapies. We talked to the father of daratumumab, Dr. Torben Plesner, on the use of this drug in treating multiple myeloma. Dr. Plesner: We had actually four classes of drugs for treatment of myeloma and we have made substantial progress with these new drugs, but now the antibodies come on stage as a totally new way of killing myeloma cells and its true to allude to that daratumumab may be combined with any sets of the previously used classes of drugs and it’s likely to provide additive or synergistic activity with these drugs for killing of myeloma cells. 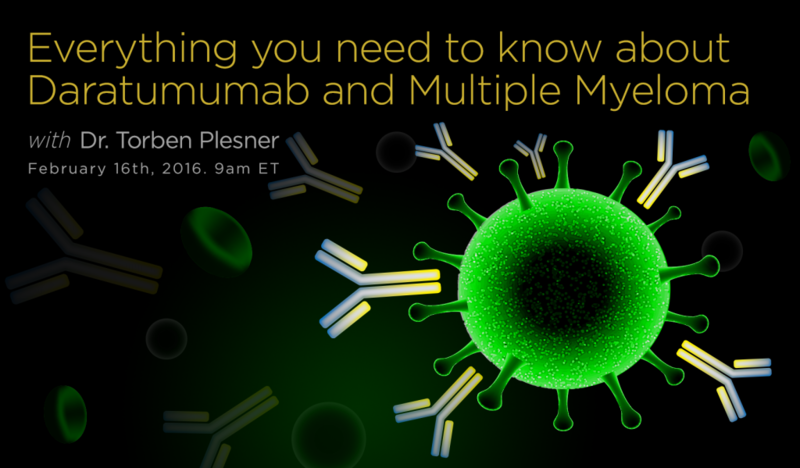 Listen to the talk on Daratumumab in multiple myeloma with Dr. Torben Plesner HERE! Combination therapy means treatment using combination of standard drugs with monoclonal antibodies, t-cell therapies with stem cell transplants, myeloma vaccine combinations and more. Dr. Saad Usmani educated us about all the promises that combination therapies has to offer. 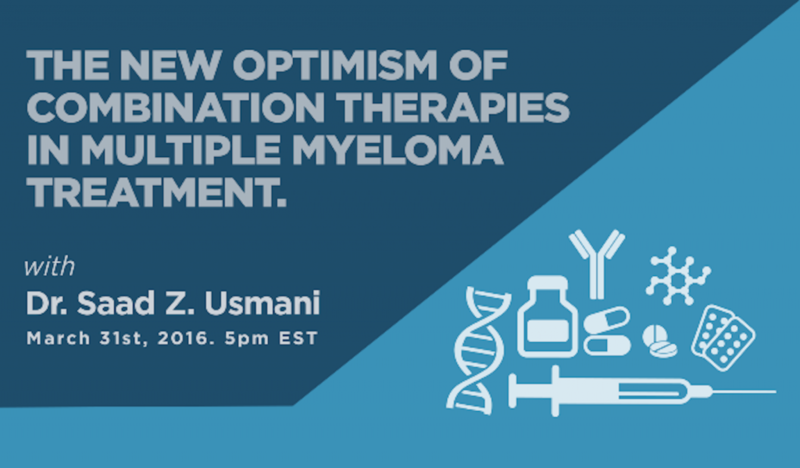 Dr. Usmani is very optimistic about the future of myeloma treatment. Dr. Usmani: This is truly an exciting time to be a myeloma researcher. 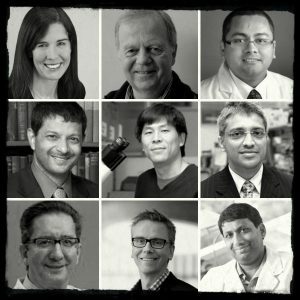 Despite our challenges of still understanding and grasping the disease biology, we have been, very successful and fortunate in many ways to have the ability to investigate several different mechanisms of actions or drug classes in myeloma today; and I think with these new drug approvals, we are still scratching the surface. Listen to the discussion with Dr. Saad Usmani on combination therapies in multiple myeloma HERE! Recently the Institute for Clinical and Economic Review (ICER) issued a 139 page “DRAFT” of a report attempting to evaluate Multiple Myeloma, its treatment protocols, drug cost comparisons and QALY (Quality-Adjusted Life Year). ICER’s recommendations are trusted and used by payers and may influence CMS (Center for Medicare and Medicaid Services) decision-making. Dr. Rajkumar of Mayo Clinic educated doctors, patients, and the general public on what these programs are and how they might affect the doctor patient relationship. This is my first time I am going to a meeting like this and my first passion is multiple myeloma and I have been over the last three or four years involved with the cost of cancer care. We will go there and see. Knowing the people in the organization, I think they are going to be very receptive to any kind of input, particularly patient input. This is a multi-step process and I think people are worried prematurely. 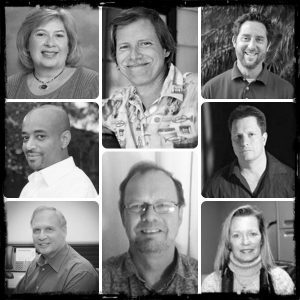 These are all well-meaning people who are faced with a very big dilemma and they have to find out some way to solve this and they are trying their best and so, I would say keep an open mind. 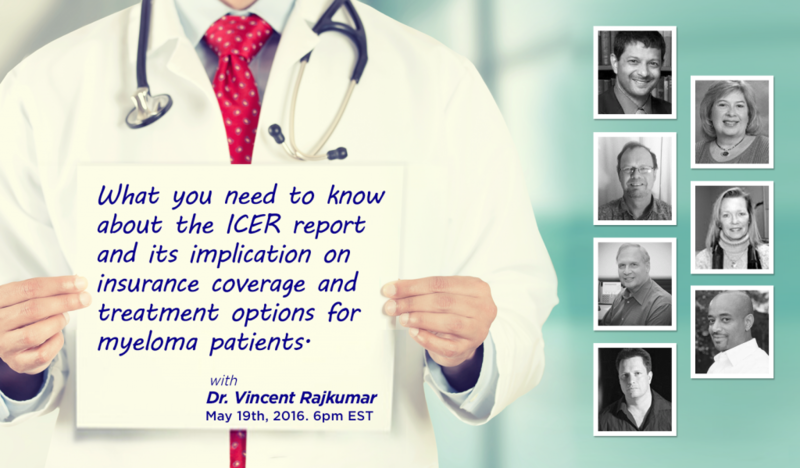 Listen to Dr. Vincent Rajkumar talk about the ICER Report HERE! Although new therapies has significantly improved outcomes for multiple myeloma patients, cure remains rare in myeloma and most people may eventually relapse. On this talk Dr. William Matsui of Johns Hopkins University School of Medicine , we discussed details of why relapses occur after several years of remission and how they can be prevented. Dr. Matsui explained at length about the type of cells he is focusing on for relapse prevention. Dr. Matsui: In tumors, what we believe is that there are cells that actually fuel the tumor and fuel growth of the tumor and its not a property that is shared by all other cells. It’s actually just a minority of cells, just like in the bone marrow with normal stem cells, there is a vast minority, a very small percentage of all the cells in the bone marrow. So, what we have been trying to do is figure out what these cells are and how they are different from the rest of the myeloma cells and ways of trying to target them. Our hopes are that if these are the sort of the factory that lead to relapse, so if we control those, then after we achieve remission, then maybe what we can do is prevent relapse from occurring. 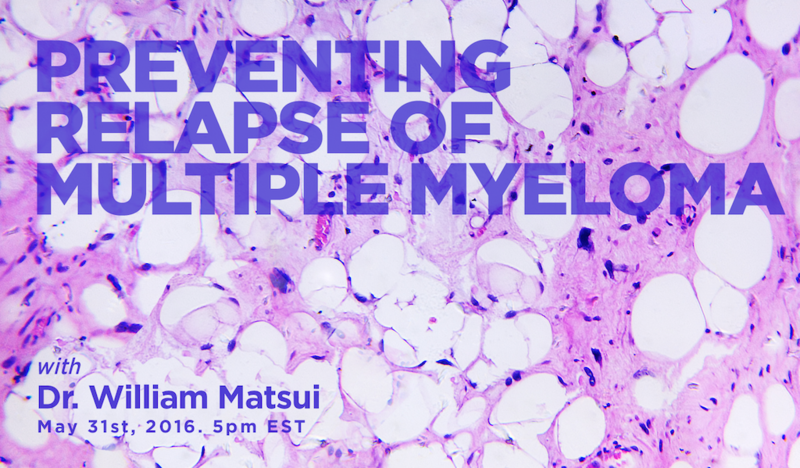 Listen to Dr. William Matsui talk on Myeloma Relapse HERE! Smoldering multiple myeloma (SMM) is an asymptomatic clonal plasma cell disorder. Since high risk SMM patients carry a high risk to progression to multiple myeloma, we decided to learn about SMM in detail via a 3 part series on SMM. In the first part, Dr. Shaji Kumar, Principal Investigator of the ASCENT trial and Mayo Clinic expert, talked about the nuances of the ASCENT trial which aims to prevent progression to active myeloma by 30-50% in the high risk SMM patients. Dr. Kumar: This trial would certainly change the way we think about this disease and maybe even other diseases where currently we just continue to watch. It is, I mean its always a balance between what side effects you could give somebody from this, though some of them may not be trivial. At the same time, you know, it must be very difficult thing for people to just go on with that sword hanging over their head. Learn about the ASCENT Clinical Trial from its principal investigator Dr. Shaji Kumar HERE! For this second talk in our high risk smoldering myeloma series, we had Prof. Jesus San Miguel from University of Navarra, Spain discuss his team’s investigations into high-risk smoldering myeloma, clinical trials in the pipeline and probable cure. Our goal is just to identify the patients who have high risk of progression interrupting myeloma. We define high risk by a rate of 50% of progression within two years or even better, 70% or 82% risk of progression within the first two years. For these patients, currently, we have decided a new clinical trial called the CESAR trial in which the goal is to evaluate the proportion of patients that can be in sustained immunotherapeutic response at five years and we consider that to be in sustained immunotherapeutic response at five years probably means to be cured. 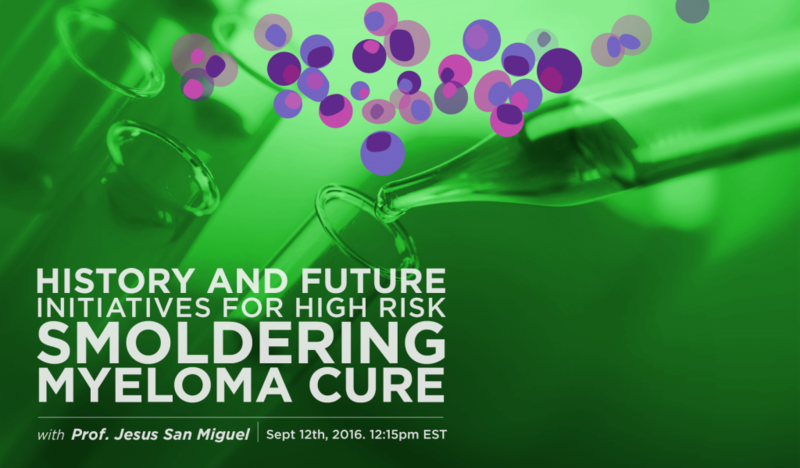 Know all about the future initiatives for smoldering myeloma treatment from Dr. Jesus San Miguel HERE! In the last part of the 3 part series on SMM, Dr. Siguror Kristinsson of the University of Iceland discussed at length about the exciting and groundbreaking iStopMM initiative wherein 140,000 Icelanders over the age of 40 will have their blood samples tested for the precursor to multiple myeloma, or MGUS (monoclonal gammopathy of undetermined significance). Dr. Kristinsson: We are working on the protocol, the exact design of the treatment trial. So, we have a randomized clinical trial that is only, that is the MGUS, the workup and the followup. Then, we are planning to offer treatments to all individuals in Iceland that will develop smoldering myeloma, all myeloma, active myeloma. Early detection has to lead to early treatment, otherwise we can might as well just wait for the patient to enter the clinic with fracture, but this is not what we believe in anymore. 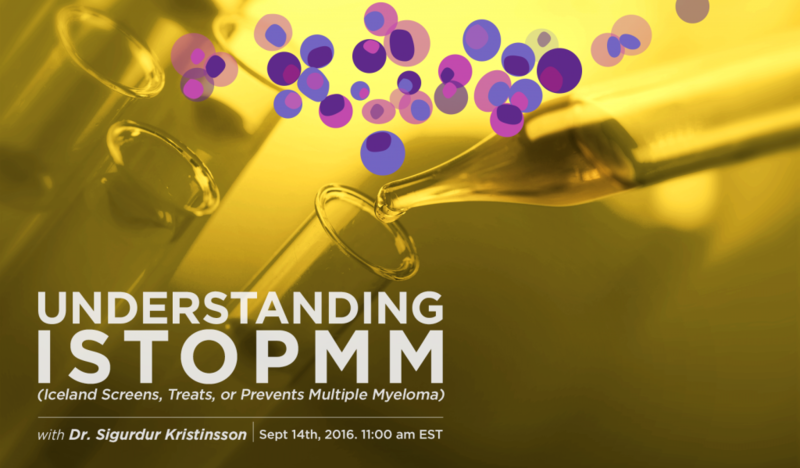 Listen to this talk by Dr. Kristinsson to learn about the iSTOPMM initiative HERE ! Myeloma is classified as high-risk based on presence of cytogenetic abnormalities and poor treatment outcomes. 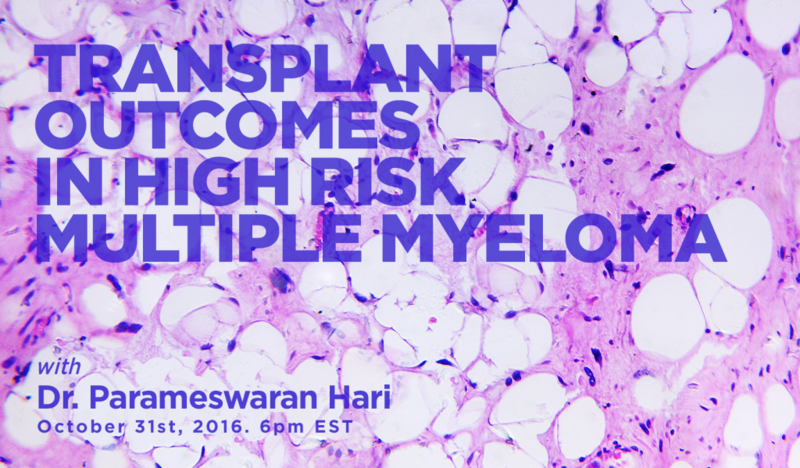 We talked to Dr. Parameswaran Hari on his recent research on post-transplant outcomes in high risk myeloma patients. There are almost 40,000 transplants being done annually in the world, almost 20,000 in the US. So, even now we do that. It has become the CIBMTR now. It used to be called the IBMTR and we track essentially everybody who gets a donor transplant in the United States, that is by law, as a law passed by the Congress saying that outcomes after a bone marrow transplant from another person, a donor transplant, have to be reported to the CIBMTR and its the CIBMTR’s job to disseminate that information about the results and so you can go to the website and find out what the survivorship of each transplant program is, but that only applies to donor transplant. 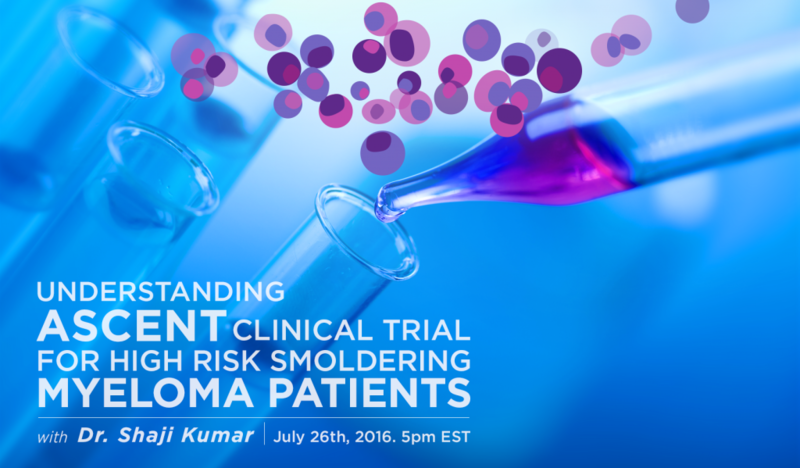 Listen to Dr. Hari talk on Post Transplant Outcomes in High Risk Multiple Myeloma HERE! We will continue to feature interesting discussions on multiple myeloma in the new year. 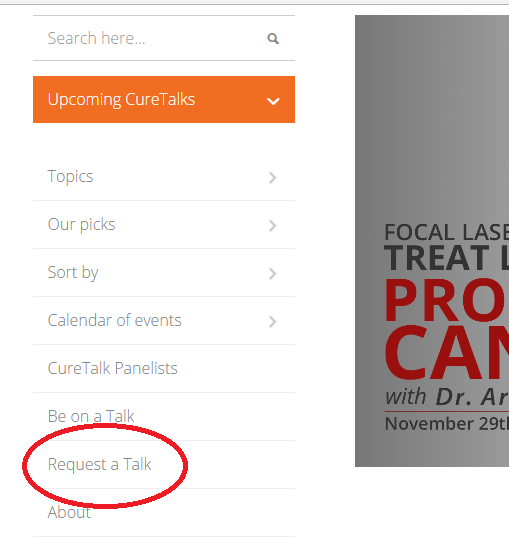 If you have a topic you would like to hear discussed on CureTalks, please post it as a comment here or use our ‘Request a talk‘ option to let us know.